Not only do pedicures feel great and produce fantastic-looking feet, but they’re also great for the health of your nails and for preventing nasty things like hang-nails, split cuticles, ingrown nails and fungal infections. Oh yes, pedicures are healthy for you! 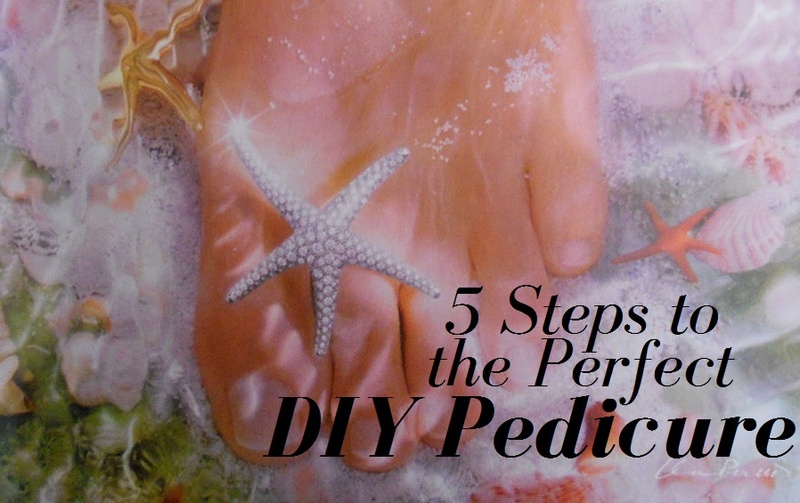 But we can’t all afford the time and money for regular pedicures at the salon, so here are five super-simple steps to the perfect DIY pedicure. Before you get started, remember to remove any polish already on your toes. Prepare a nice, warm bubble-bath for your feet by filling a large bowl or tub with warm water and your favourite bath soak. This might be bath gel, bath milk, a bath bomb, a proper foot-soak or just a little essential oil. You might like to add some Epsom salts to the bath to relieve aching feet and absorb some helpful minerals into your body. Sit back and enjoy the soak with some music or a book for ten minutes or so. Time for your toes to get some TLC. Towel off your feet and rub a little cuticle oil into the base of each toe nail, ensuring each cuticle gets a good dose of oil. Use a cuticle stick to gently push back your cuticles, which helps remove dead cells and stimulate nail growth. Stimulate your skin with an exfoliating foot scrub. A course scrub will get the best results and help remove dead cells and smooth rough skin. Work the scrub over all areas of your foot and ankle, concentrating a little extra effort on rough and callused areas. Rinse off your feet then use a callus file to smooth-out problem areas, like cracked heels or callused toes. Massage some rich, non-greasy moisturiser into each foot. You can even use a moisturising foot mask beforehand, if you want. You might also choose to add a little peppermint oil to your moisturising routine to soothe tired soles. For cracked heels, try rubbing in a little Shea butter. Trim your nails to the desired length and smooth off any sharp or uneven edges with a nail file. Trim the nail edges at a 45 degree angle to help prevent painful ingrown nails. Wipe each nail with a little nail polish to remove any left-over oils, then separate your toes – if you don’t have a toe separator, some large cotton balls will do nicely. Now for the fun part – pick your colour and paint those nails, your toes are your canvas! Apply two or three coats for best results, and apply a coat of clear polish over the top every few days to make your colour last. Fix any spills or stains on your toes by dipping a cotton bud in nail polish remover and gently rubbing until the unwanted polish is removed. Regular pedicures help keep your nails strong, stimulate growth, help prevent fungal infections and keep your toes looking perfect and primed to show off in your best heels! If you’re unlucky enough to notice the symptoms of a fungal infection under the nails, start treatment immediately with a high-quality treatment like Excilor. But prevention is the best medicine, so what better excuse to keep your feet looking first class? And this cheap, simple, at-home method will mean more cash for flashy shoes to show off your fancy feet!